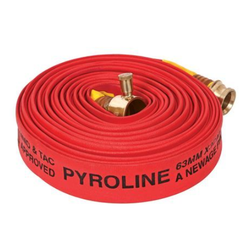 Leading Service Provider of pyroline fire hose and pyroprotect fire hose from Nagpur. We are offering Pyroline Fire Hose to our clients. Non-percolating flexible firefighting hose. Resistant to liquids, chemicals, abrasion & heat. Fully fitted with Hose Coupling made of Gunmetal Pair of male & female parts Instantaneous. Standards IS 903 ISI mark. We are offering Pyroprotect Fire Hose to our clients. Three layered synthetic jacketed with elastomeric outer covering highly resistant to liquids, oils, chemicals, acid, alkalis, solvent, abrasion & heat. Looking for Fire Hoses ?